Toronto, ON, Jan 19, 2015 – Lumentra Inc. is now approved by the California Energy Commission (CEC) as a test lab and third party certifier for lighting products. 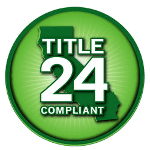 Title 24 mandates building energy efficiency requirements in California. Lighting manufacturers must meet certain performance requirements in order to legally sell their products within California. Lumentra has the technical expertise and accreditations to help manufacturers meet these requirements. For more information on how to get this process started, please see our Title 24 information page. Lumentra is a cleantech company that develops new materials solutions for solid state lighting products. Lumentra is a spin-off company from the Impact Centre at the University of Toronto. Lumentra is ISO 17025 accredited by NVLAP (NVLAP Lab Code 500084-0) and provides accredited optical, electrical, thermal and environmental measurement services, optical design services, consultancy and standards compliance assistance for the lighting industry. Lumentra’s staff are actively involved in international standard committees to develop standard test methods for semiconductor and organic LEDs.